September 3–Summer may be coming to a close, but fear not! 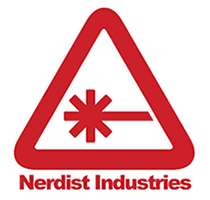 Nerdist Industries has a veritable cornucopia of new content premiering this fall to get you through the coming months. The entertainment and editorial hub will now be releasing premium content seasonally, while continuing to build out all of your franchise favorites. Nerdist is coming out swinging with a fall line-up filled with some heavy-hitting content, including, but definitely not limited to: a weekly comedy musical series written, directed, starring and solely featuring Liam Lynch called The Adventures of The Sweet Electric (premiered 9/2), which follows the interstellar adventures of the futuristic robot band “The Sweet Electric” as they travel the galaxy from gig to gig; Scott Ian’s Bloodworks, which offers an exclusive look at the most impressive makeup and effects artists in the business from musician Scott Ian of Anthrax; and theReal Housewives of Horror, a gruesome parody of, you guessed it, the Real Housewives shows,created by and starring Brea Grant (Dexter, Heroes) and Executive Produced by Kevin Pereira (G4’sAttack of the Show). Standing at the forefront of the Cosplay world, Nerdist continues to showcase creative talent with new weekly series Just Cosplay and Origin Story, premiering 9/5 and 10/24, respectively. A brand new series called Nerdist Presents will also be offering a series of one-off videos premiering bi-weekly on Nerdist.com that will feature parodies of tentpole hits (Doctor Who, The Walking Dead, Game of Thrones, Guardians of the Galaxy) along with music videos and celebrity cameos (premiering 9/10). In addition to the above, Nerdist is expanding and fleshing out their franchise series, includingNerdist News, in which Jessica Chobot dishes, discusses and analyzes your Monday through Fridayfix of the most important news in the Nerdverse; The Dan Cave, Dan Casey’s fun-, pun-, and sarcasm-filled guide to all things pop culture (weekly); and Nerdist Play with Malik Forté, the dedicated video game corner of Neighborhood Nerdist (weekly). Joining this epic lineup isBecause Science with Kyle Hill, which examines all the secret science in your favorite fandoms(premiering late September). Check out the full fall line-up here! Cast of Elementary comes to NYCC!